Let me just tell you that my husband raved about this meatloaf. He said it was the best one he's ever had. Maybe he was just hungry, but it was pretty good! I love using oatmeal as a filler instead of bread crumbs because it's healthier. I tried out using my cast iron skillet for this meatloaf and it turned out great! You could of course use a regular pan, but the skillet was fun! I'm loving finding new uses for my cast iron skillet. I used to only think you used it to make corn bread! haha What do you use yours for? Preheat oven to 350 degrees. Stir oats, milk, parsley, Worcestershire sauce, egg, mustard, onion powder, garlic powder, salt, and pepper together in a large bowl.Add ground meat and combine until mixed. Coat an 8-inch cast iron skillet in olive oil. Place mixture in cast iron skillet coating the bottom of the meat with the olive oil and then flip it over. Spread it out to fit the skillet and pat it down. Bake for 40-60 minutes until the internal temperature is at least 160 degrees. 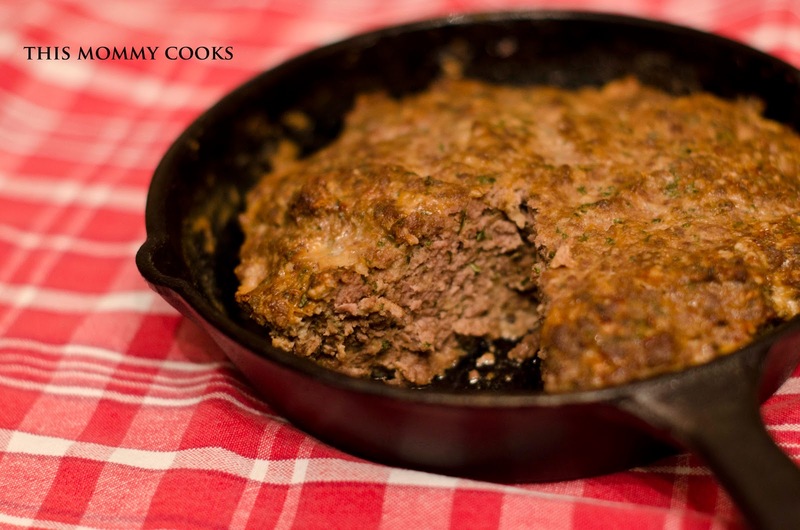 Once the meatloaf is cooked, pour off excess grease and oil so the meat doesn't absorb it. It must be good; I love adding oatmeal to my dishes and with ground turkey; it's a winner. I use my cast iron for anything I use a skillet for. Got rid of all the teflon/non stick pans recently and went with only cast iron and enamel cast iron. Thank you for posting this recipe for meatloaf. Some could appreciate that you substitute oatmeal for breadcrumbs for additional health value.